Port Vale have signed former Porto winger Enoch Andoh on an 18-month deal, subject to international clearance. Meanwhile, fellow winger Mark Marshall is hoping to extend his stay with Vale. The summer signing, enjoying a second chance in the game following a two-year drugs ban, made his comeback in February on a short-term deal at Coventry City. Enoch Andoh spent the 2011-12 season at FC Porto, helping their youth side to an under-19 championship. 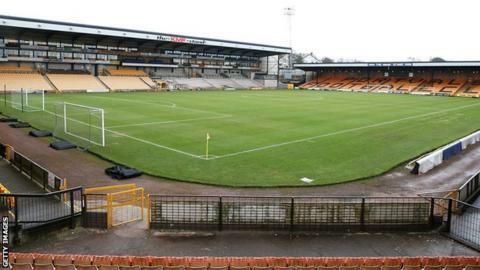 But, since opting to move on this summer, the 26-year-old Jamaican has flourished at Vale Park after signing a one-year deal. "There's no better feeling than to be loved and appreciated. And I'm appreciated here," he told BBC Radio Stoke. "And, if something is sorted out, I'd be happy to stay. "Every time I go out there, it's an opportunity to be on the football pitch doing something that I love. "Long may I continue to play well and long may the team keep climbing the table. Maybe we could sneak into the play-offs as there's not much in it." Marshall, who tested positive for a banned stimulant following a League Two game between Barnet and Dagenham on Boxing Day 2011, was released by the Bees after his ban was imposed in May 2012. He then made 14 appearances for Coventry over the final three months of last season, eight of them coming off the bench. And he has been almost a fixture for Vale this season, scoring three times in 21 appearances.